Kapani School Project – Digital Recruitment and me. The Kapani School Project was established in 1986. Its primary aim is to give an education to children who otherwise would not be able to go to school. The project originally chose not to send students to college since the costs were so high but a few years ago we sent our first person to a teachers training college. That lady is now a qualified teacher and has returned to Yosefe School. Yosefe School in Mfuwe is the flagship of our project. It gets no grant from government so we undertake its maintenance and over the years we have improved and increased the infrastructure at the school. We have built nine teachers’ houses. (The government will only allocate teachers to a school if there is suitable accommodation for them). We have put in a borehole and a hand pump. Clean water is essential to good health and this borehole is a treasure not only to the school but also to the surrounding communities. We have also built two new classroom blocks and renovated the existing ones, whilst also adding a laboratory to the list of school facilities. In 2008 we added a further block of 3 classrooms. A painting competition was held and the winners painted a mural on the new block facing the tarmac road in Mfuwe and were treated to a night in one of our bushcamps. There is now a library stocked with books donated from around the world. All of our projects are ongoing and require constant funding. We have decided also to spread our infrastructural support beyond Yosefe School and are trying to raise funds to build another three classroom block at Mfuwe Basic School. This school is just a few miles from Yosefe but it is in desperate need of support and we are hoping that with the assistance of our donors we will be able to bring about some changes at this school in the same way as we have done over the years at Yosefe. Conservation awareness is a vital lesson to learn in an area like ours where people live side by side with animals. We regularly take groups of children into the National Park and give lectures on various conservation issues. The general attitude towards wildlife in the villages is negative – elephants destroy crops, lions eat people or livestock, and impala are just meat to eat. As a result of our efforts it is rewarding to see the changing attitudes in these young people. In 2007 we organised a tree planting competition and the winners were treated to a night at one of our bushcamps. They just loved it! There is much suspicion these days about the proportion of any donation that is absorbed by the administration of large international charities. 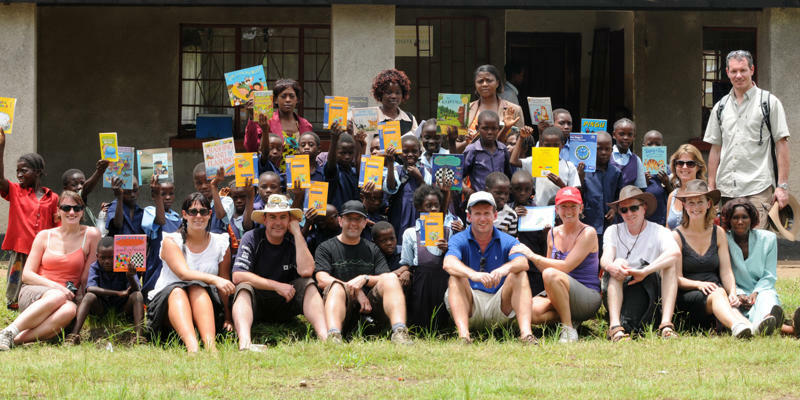 Our project is different – all members are volunteers and any administrative costs are borne by the company meaning that every penny generously donated goes directly to educating children. If you would like to make a donation then even a small amount can go a very long way and can make a big difference to a child who otherwise may not get an education. you may send a cheque payable to ?? ?Kapani School Project??? to us at Kapani Lodge, Box 100, Mfuwe, Zambia.